Continental European before 1800, Yorkshire and the Humber: Artists and Subjects 10 comments Is this painting after Teniers II? Who is the artist? 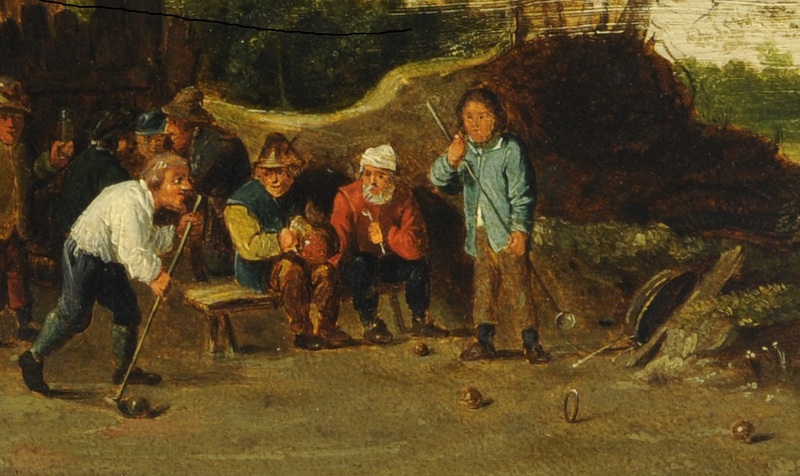 The style of this work seems to be very much after David Teniers II: the 'bowling' in the linked work is actually, as in the Sheffield painting, a version of croquet. There may be another, closer, work by Teniers. The collection comments: 'We don't have any further information on this work, unfortunately, but we do have a work in the School of David Teniers II called 'Shuttlecock' also from the Graves Gift, so possibly by the same artist? This certainly looks like it is a copy after Teniers II although I cannot find an original. It is derived from a known painting that is titled as 'Peasants playing Skittles' although it is a form of 'kolf' they seem to be playing. Sadly I very much doubt you will ever find the name of the artist as the painting does not display much quality and is quite poorly painted it is almost certainly by an amateur painter. Thomas van Apshoven did many of these copies after/in the manner of Teniers - this might be one of his. In 2013-14 I've had extended communications with Ms. Natalie Patel, Curatorial and Exhibitions Assistant (Duke of Portland) collections) at Sheffield, regarding this painting. I've provided her with several comparanda images (too many to publish them here) and information on the ball game. This information included descriptions of the game defined as croquet by Dr. Gehring, and kolf by Dr. Lidtke. The Game of Troco, or beugelen, or closh(klossen), or early shuttlecock also known as trucco, or trucks, or lawn billiards, or ring ball was already played in the late 15th century, became popular in the 17th century (until 1800) and Flemish peasants were among many others who enjoyed it. In our Email exchanges Ms. Patel mentioned that she examined and discussed the painting with Sheffild Curator of Visual Art. Are you aware of this 2013-14 preliminary research of the painting? I was not aware of the research you mention, which is not reflected in the information on ArtUK. Which is why I made the suggestion. If you are interested I will be happy to send you copies of my Emails/files exchanges with Ms. Patel. You will be able to select images and information you consider useful for this discussion. Please contact me via Email btsirelson@gmail.com for that. I have to be careful what I say having been chucked off other detictivvin' on this site, but can anyone with better vision on this interest see the monogram, right blue clad figure half way diagonal to lad diggin' in pit? A Hi-Res photo is definitely NEEDED and it will hopefully provide more clues. In my 2013-14 cursory research I've found multiple paintings of ball games, allegedly by D. Teniers, which reminisce the Sheffield painting. Many elements of the Sheffield painting are present in them. An earlier "Smith's Catalogue Raisonne listed over 900 paintings accepted as original productions of Teniers". Another scholar suggested that about 2,000 paintings should have been attributed to him. Some of his paintings were signed with his full name, some with only initials, others with monograms. Also, eleven artists, all with the name Teniers, from the same Flemish family, are known to have painted works now in various world museums and private collections. The members of the Teniers family copied each other's work. In addition, the popularity of these paintings, even in the 17th century, encouraged numerous copies and forgeries. 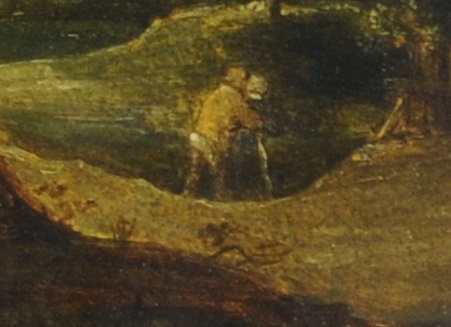 According to 2007 Sotheby's entry "the form of Teniers' signature, with the S of the painter's name missing, was not used after 1635". Please find attached two high-resolution images, showing the ball game and a possible monogram. Perhaps the figures are not meant to be seen at close range, but they are remarkably crude. I assume Teniers would have done better.